Areva has permission to conduct early stage tests on a new cancer treatment using lead-212, which can be extracted from industrial activities including the reprocessing of used nuclear fuel. In a technique called alpha radioimmunotherapy, lead-212 would be attached to an antibody destined to bind to a unique antigen expressed by cancer cells. This method reduces radiation dose to normal tissues by delivering lethal doses of radiation directly to cancer cells. Approval from the US Food and Drug Administration (FDA) for Phase I clinical trials means Areva subsidiary Areva Med can begin tests to confirm the safety of treatment in patients. Lead-212 has a half-life of 10.6 hours. 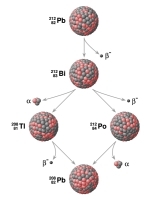 Its decay chain includes the short-lived isotopes bismuth-212, polonium-212 and thallium-208, which all emit either alpha or beta during decay over about another hour. The end of the decay chain is the stable element lead-208. Last year Areva announced that it would build a facility to produce lead-212, which it can extract from thorium remaining after "industrial activities" as well as from used nuclear fuel. The most widely used medical isotope is molybdenum-99, which decays to technetium-99 en route to hospitals. Supplies of this have been severely constrained in recent years due to major repairs to Canada's National Research Universal production reactor at Chalk River and the High-Flux Reactor at Petten in the Netherlands. Both of these veteran reactors are back in full operation, but the shock of shortages has caused many countries to move to secure their supplies. Among the most recent developments is the government of Canada's decision yesterday to invest C$35 million ($35 million) in developing four different accelerator-driven production methods, which would reduce reliance on ageing research reactors.